← Spellbinders and Core’dinations Blog Swap! Just a quick post and picture today. I’m featured on the SCRAPBOOK ADHESIVES BY 3L blog today with this project using vintage spools. Head on over to the SCRAPBOOK ADHESIVES BY 3L Blog for the details on this project, and then the Graphic 45 Blog. Just by leaving a comment on each of those blogs you will be entered into drawings for prizes from each company!! 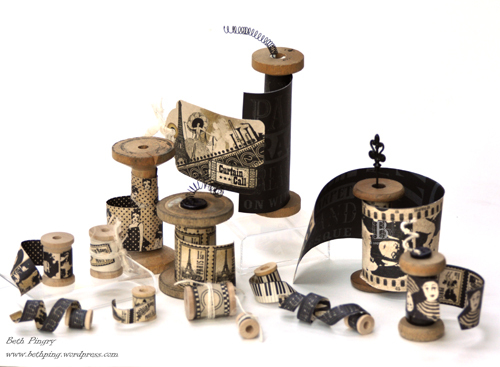 This entry was posted in mixed media, SCRAPBOOK ADHESIVES BY 3L, Uncategorized and tagged Graphic 45, vintage spools. Bookmark the permalink. These are simply delightful! I can’t stop looking at them! Those are just fabulous!! Perfect paper choice for the spools. I give you credit, you cut it….I usually just “collect” and look at my Graphic…..have a hard time cutting it–just kidding!! !